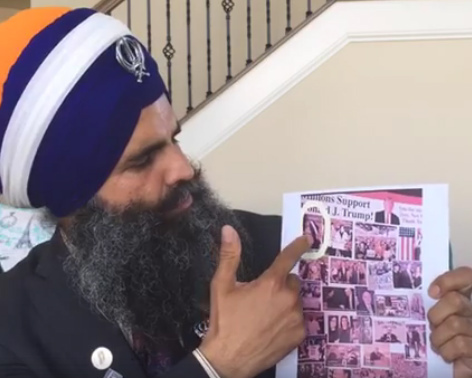 Gurinder Singh Khalsa spoke on Facebook to explain the Trump campaign error. Credit: SikhsPAC Facebook. 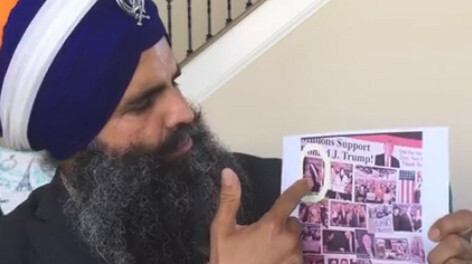 A Sikh man was misidentified as Muslim supporter of Donald Trump on a campaign leaflet in Ohio. Gurinder Singh Khalsa, however, is not a Trump supporter. Nor did the Trump campaign get his permission to use his photograph. Singh Khalsa’s political engagements with “SikhsPAC” are non-partisan. This group aims to educate American society about the Sikh religion. And works to engage Sikhs in politics and prepare young Sikhs for careers in public office. The key is to make Sikhs part of the political conversation. He has lived in Indiana for eight years, after arriving from India in 1996. On Facebook, Singh Khalsa posted a short video to highlight this misidentification. He found the incident “shocking” and “disturbing”. If there was criticism of the Trump campaign. He also had a deeper, more serious point. That racism and violence against Sikhs has intensified since 9/11. Singh Khalsa has said that Sikhs have also been accused of being part of ISIS. A lack of religious literacy in American society has broader implications. A 2015 poll found that just 11 per cent of individuals in the United States had identified a photo of Sikh man by his correct faith. A fifth thought the man in the photo was Muslim. And almost a third believed he was Middle Eastern. In 2013, a study from academics at Stamford University found deep confusion about the differences between Sikhism and Islam. Despite Sikhism being one of the largest global religions. In late September a Sikh man was assaulted in an unprovoked attack in California. Maan Singh Khalsa, 41, was assaulted by a group of men who threw a beer can at his truck, and cursing at him. The group followed Khalsa in their pickup truck before pulling his head out of the window, tearing off his turban and cutting his long hair. Advocacy groups including the Alliance of South Asians Taking Action, National Religious Campaign Against Torture, Sikh Coalition and Take on Hate lobbied for the police to treat it as a hate crime. Following the hate crime charges the Sikh Coalition said that “Sikhs remain hundreds of times more likely to be targeted in cases of profiling, bigotry and backlash than the average American,” in a post-9/11 climate. Trump’s anti-Muslim policy ideas and overtures alienate a majority of American Muslims. A recent poll found just 4 per cent would vote for Trump next month. A spate of graffiti at a Muslim place of worship in New Jersey read “F*** Muslims,” “F*** Allah,” and “F*** Arabs!”. Someone had also dubbed “Donald Trump” on the one of the walls.